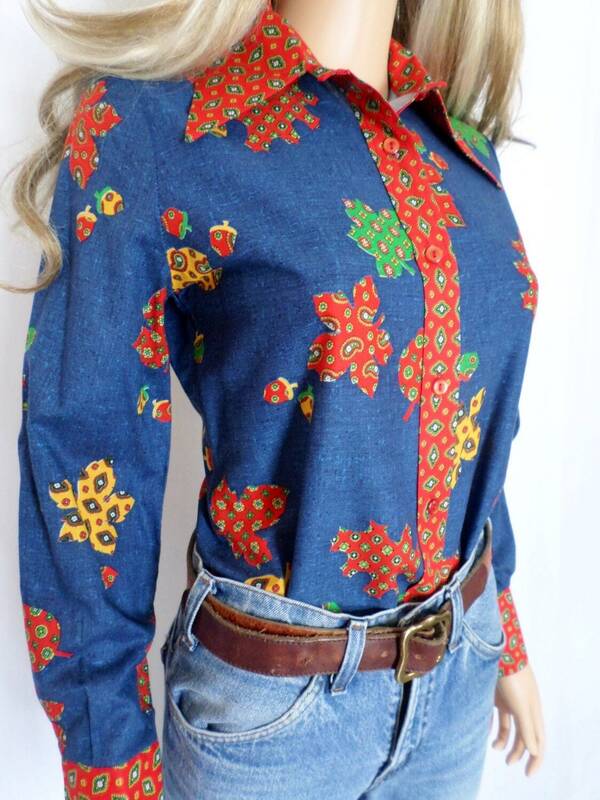 VINTAGE 1960's / 70's RETRO DENIM PATTERNED BLOUSE WITH PAISLEY PRINTED LEAVES AND ACORNS. 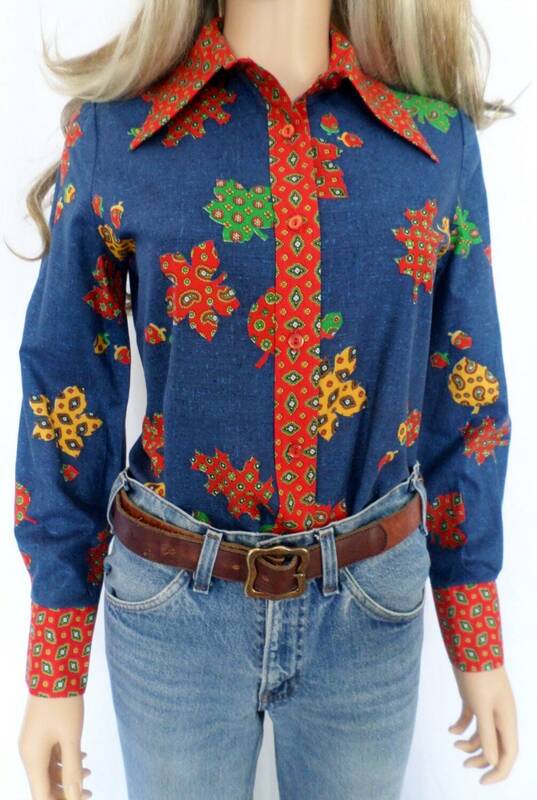 I was attracted to how unique this shirt is with such a great fall / winter pattern on it. 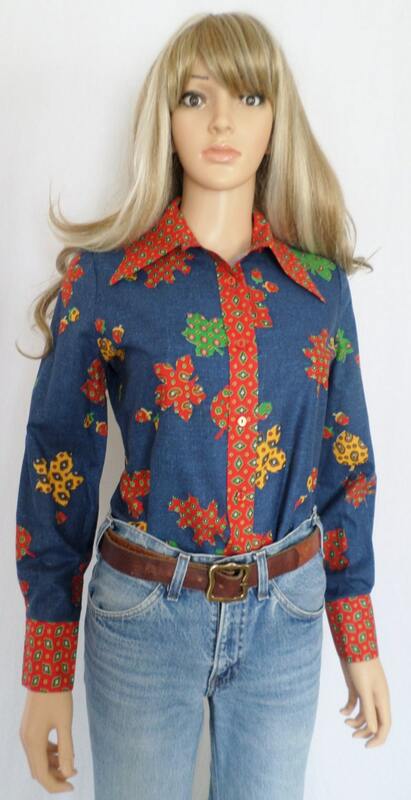 Very comfortable shirt and looks great with jeans or you can dress it up for career. Classic and versatile piece for your wardrobe this season. Patterned details on the collar, cuffs, and mid-line. Condition: excellent with no flaws and cleaned by my expensive vintage specialists. 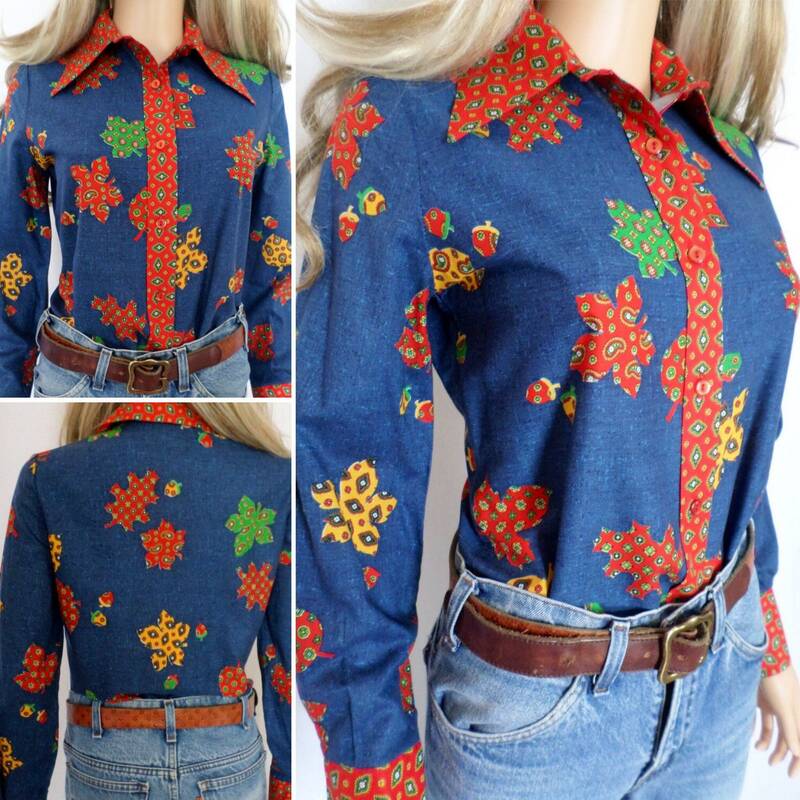 It is very hard to find cool women's shirts from this era, especially in this condition and size! All items must be paid in full before shipping. I have never experienced fraud with etsy's merchant service provider. It's safe and hassle free! Some states like Washington, Pennsylvania & Minnesota, along with countries such as Australia are now working with online merchants and forcing sales tax when you make a purchase. I do not personally collect this tax, it is charged and deposited directly to the merchant service provider etsy uses. RULES for RESERVING items in this store, you are required to read this when you're making payments in my shop. If I agree to reserve an item you must pay a NON refundable deposit. It's a simple process of paying 20%. I can work with your budget however if you are not communicating or being difficult your plan defaults to a 30 day policy. You will have 30 days to pay for the item in full unless prior arrangements are made. You can make payments during this time or you can pay it all off at once. I do expect communication throughout from you. I do not have time nor the desire to hassle people to pay me, so if you break your payment plan arrangement items will be put on the open market and available to everyone if you do not pay on time. Your 30 days Starts with the day you put down your first payment/ deposit. All payments & deposits are NON refundable. Due to being very descriptive with my restored, cleaned & repaired items I do not allow returns or store credit credit. All sales are final. Shipping cost for domestic & international buyers are always rising. For this reason my rates are discounted for you. I most often pay more for the shipping than what is paid by the buyer, I also pay for the shipping supplies and the insurance. I AM NOT RESPONSIBLE FOR DELAYS or lost mail by the postal service. I am NOT responsible for the errors of the postal service. I cannot control any errors they cause. Fedex seems to be the only way to avoid any delays or errors in my experience. Message me if you would like to use them instead of usps but they do cost more. USPS is NOT me and I do not have any control over their services, so I cannot be responsible for: DELAYS, LOST, STOLEN, Damage or Incorrect addresses. The only way I can guarantee no issues from shipping items, such as errors with scanning or tracking info due to USPS incompetency is to use Fedex which is also more expensive. IF ITEMS ARE RETURNED TO ME FOR ANY REASON YOU ARE RESPONSIBLE FOR PAYING TO RESHIP THE ITEM. IF YOUR ITEM IS RETURNED TO ME BECAUSE YOU DID NOT PICK IT UP FROM THE POST OFFICE OR PAY CUSTOMS THE ITEM IS RE-LISTED IF YOU DO NOT AGREE TO PAY FOR RE-SHIPPING IT. If you need it quicker please message me to edit the listing before you pay with the appropriate rate. I am not responsible for delays due to weather, etc... By postal services. NO CUSTOMS / DUTIES ARE PAID BY ME FOR INTERNATIONAL PACKAGES. BUYER IS RESPONSIBLE FOR ALL CUSTOMS FEES. If the address is not valid and the package is returned or lost I am not responsible. I will not cancel or refund the transaction. INTERNATIONAL CUSTOMERS: It is your responsibility to check and pay customs for your items, DO NOT MESSAGE ME WITH "WHERE IS MY ITEM?" Or open a case of the item is not delivered. If your item is returned to me for any reason it will be re listed and re-sold to the open market if payment to re-ship the item is refused by you. EU customers will be banned indefinitely if a return is forced. Your info will go on a list and any future transactions will be cancelled. I will not ship your item unless it's paid in full. When I mark a payment or deposit shipped, it's only for Etsy to know I’m not delinquent in shipping my items. When your item is paid it off tracking info will be uploaded automatically. Please do NOT ask for your item to be marked as a gift or at a lower value. This request will be refused. I cannot insure the package and this is illegal. All supplies needed to ship your package. I go above & beyond all other sellers to do the best I can to have our items restored for our clients. This is very costly! I have had many bad experiences forcing me to uphold these policies. All customers are required to check measurements before purchase, no returns are accepted due to items not fitting. I do not accept returns or exchanges. I provide measurements and mention sizes in all my listings. I do my best to make sure all items fit and have a very high success rate. My clothes and shoes fit my customers when they arrive if measurements are checked by the customer before purchase. You can also ask questions which I am happy to answer to assist everyone before purchase. I reply quickly too! If items are damaged post receiving them it is not my responsibility to fix these issues. We carefully inspect everything the best that I can. If you are in the EU and try to return an item you will be banned from shopping with me indefinitely. If you require pictures or any additional information than provided, please ask because I am happy to assist you before the purchase is made. I give very detailed descriptions and do the best that I can. I pay a lot to have things cleaned and repaired, but remember these items are old & used and things could be missed. I do not guarantee these things because they are not new. If shoes break heels, need new adhesive, need new soles, new inserts these are things I cannot promise won't need to be repaired, especially once worn. I do not put all our items through a test by wearing them so I cannot guarantee them needing further restoration. NO REFUNDS or PARTIAL REFUNDS ARE ISSUED. 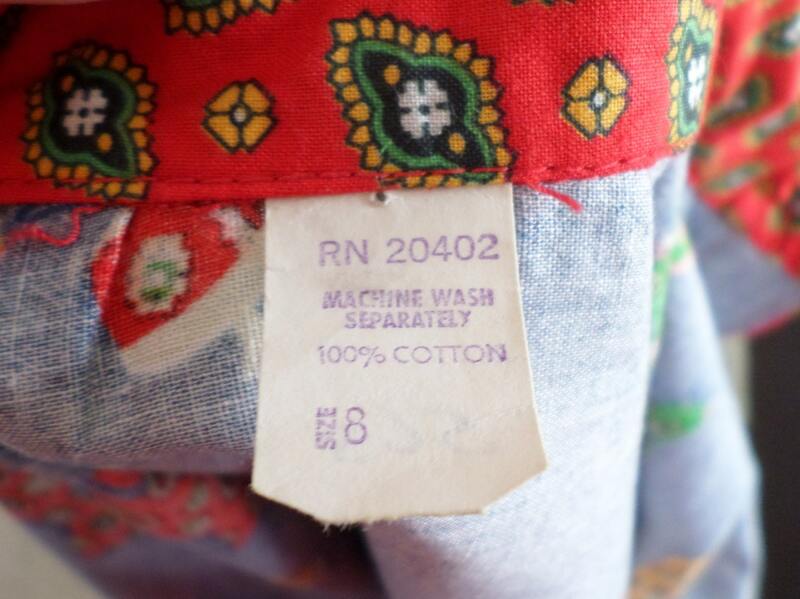 ALL Vintage ITEMS ARE DESCRIBED TO THE BEST OF MY ABILITY. If you attempt to force a return by shipping the item back to me, I do not refund your payment. You are responsible to pay to ship the item back to you or be out the total amount. All deposits & payments on items are non-refundable. If the item is not paid in full by 30 days from your first payment / deposit, you will loose your money unless another agreement has been made with me. Payment plans are taken very seriously. If a person disappears or does not uphold the agreements of the payment then you will loose all money paid. Rare vintage items are expensive as well as collectible. I focus on the fellow collector in my store. This is why items are put into the best condition I can possibly get them in. My cleaning bills are what stores pay in rent every month, but I put this money into the products I sell instead. I do not use any information for any reason.